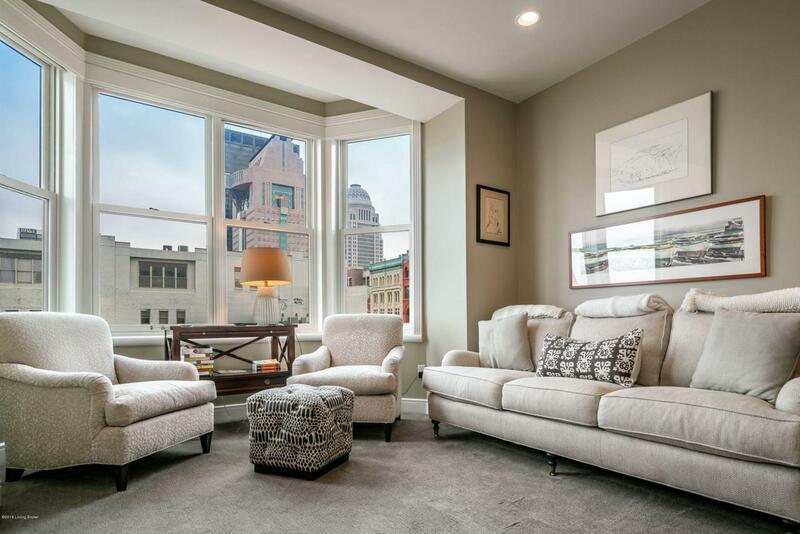 Come enjoy this luxurious and updated downtown condominium located in the historic Harbison at the corner of 7th and Main Streets across from 21C Hotel. With captivating views of the Ohio River and downtown Louisville, this immaculate space is enveloped in natural light and beauty. This impeccable home was completely renovated combining two units and professionally designed. It boasts beautiful hardwood floors, an open floor plan including a great room that can host a baby grand piano, dining room and living room overlooking Main Street and a fabulous kitchen overlooking the river and bridges. The kitchen has custom grey cabinets, Marron Cohiba suede granite countertops, an island large enough for 6 people, high end stainless appliances and a butler's pantry area. The master suite alsoMore...overlooks the river and comes with two separate walk-in closets with custom shelving and dual master bathrooms one finished in white marble, crystal and chrome hardware with an art deco style. The guest suite is privately located on the opposite end of the condo with a walk-in closet and stylish ensuite full bathroom. In addition, the third bedroom is currently used as an office and sports large bay windows, remote blinds and a built-in desk. Let's step outside to the enclosed porch with commercial grade windows and finishes overlooking the river and is perfect for entertaining and large enough for a sofa, dining table and chairs, TV and more. There is also a balcony with spectacular views and perfect for your electric grill. Not to be missed, but not common for a condo is the large storage room with custom shelving and two doors, in addition to a separate laundry room with Allmilmo cabinets, designer Formica countertops, a laundry sink, and room for a second refrigerator and drying racks. Located in the middle of all the downtown action day and night. Close to 21C Hotel, Proof on Main, Morton's Steakhouse, Ali Center, Mussel & Burger Bar, KMAC Museum, Leadership Louisville, Slugger Bat Museum and Frazier Museum. It's not far from the YUM Center, KY Center for the Arts and Actors Theatre. The Harbison is a secured building and provides common areas, and additional storage in the basement. Garbage and recycling facility is located on the unit floor and is accessible 24/7. Multiple covered parking options within a block of the building. Listing provided courtesy of Parker & Klein Real Estate. © 2019 Metro Search, Inc. All rights reserved.